There were 56 individuals who signed the Declaration of Independence. There were thousands of others who put their lives on the line to ensure that the United States of America became established through the Revolutionary War and the adoption of the US Constitution and Bill of Rights. 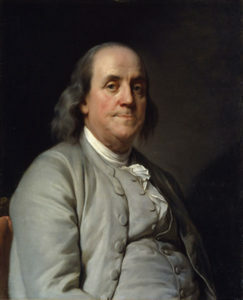 However, there is only one Benjamin Franklin. He was a true renaissance man, with vast knowledge in many subject areas, and one who mastered several professions. He was an author, a printer, politician, postmaster, scientist, inventor, civic activist, statesman and diplomat. He is one who lived his life true to his God and to the Republic of which he helped create. He is one who is synonymous with freedom and liberty. Scott D. Welch is a senior consultant to IC Liberty Films LLC, the distribution and marketing company of the historic Educational Dramatic Comedy movie In Search of Liberty. In the family-friendly movie, a captivating statesman from America’s past takes a modern-day family on a series of wild adventures. With a spicy mix of humor, magic and logic, he opens their eyes to the origins and importance of the U.S. Constitution, the degree to which it is under attack today and what can and must be done to save it.